Everyone in the business has something to say about flail mowers versus rotary mowers. 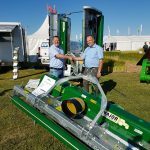 Each type has its own advantages and a good dealer will set you up with a mower suited to your machine, application, and requirements. The Major Synergy mowing deck offers a superior alternative to the standard factory-fitted outfront mowing attachments found on John Deere, Kubota, Shibaura, and Iseki tractors. Its one-of-a-kind blade system delivers a professional striped finish – even on long grass – at incredibly fast forward speeds. Designed for efficiency, strength and versatility, the Major Synergy is ideal for sports pitches, parklands, municipalities/councils and residential/lifestyle complexes. We could go on about how the Synergy’s unique driveline keeps fuel costs low and how all Major machinery are simple to maintain, but we’ll let our happy customers speak for themselves. We have to cut and strim 2 million square metres of grass, so it’s important that the tools we use are efficient, reliable and deliver results. 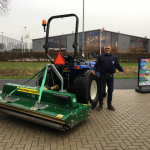 The Major Synergy out front mower is very versatile because we can use it around the housing estates and then mow the cricket fields with the same machine. The roller on the rear gives a nice striped effect and we have had very positive feedback from residents about that. We’re specialist solar energy site maintenance contractors based in Cornwall. 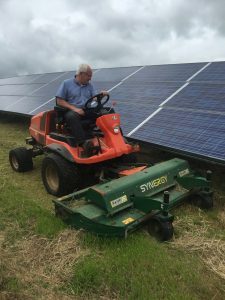 Because of the construction design of most solar energy farms, you can’t just get away with ordinary equipment to control grass and weeds under the panels. Our Synergy mower definitely proved itself to have been the right machine. We use it with our Kubota F Series and it has a two metre cut and can handle the very heavy overgrown areas as well as leaving a very tidy, striped finish. The best feature of all is the fact that it is PTO and shaft driven to three twin bladed rotors and so we don’t have the inherent problems of belts slipping when the going gets tough. These blades help mulch the clippings and distribute them evenly across the width of the mower. We provide interior and exterior landscaping services to schools, airports and commercial clients throughout the UK. We bought the 2m Synergy mowers to replace the decks on our John Deere 1545 power units. The quality of cut is excellent. The Synergy mower cuts the material so finely, that we no longer have to collect the cut grass, saving time and allowing us to get through our mowing schedule more efficiently. Grassland maintenance happens every day here from March until the end of October. We have to prepare different sites for varying purposes. For example, the car-park areas need to have a longer finish – about two inches, whereas the gardens and hotel amenities will require a much shorter finish. 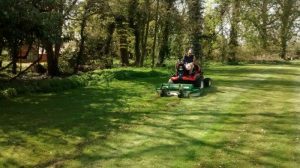 We used to use cylinder mowers for much of the work, but these have become very expensive to maintain both in terms of replacement costs, blade sharpening and reliability down-time. Three years ago, we invested in a Major Synergy deck that fit to our John Deere outfront power unit and we love it! The Synergy is easy to set-up for different cutting heights. 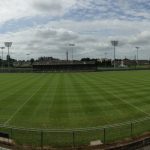 It doesn’t need anywhere near the maintenance of the cylinder mower and yet leaves the perfect, striped finish, no matter what we are cutting. 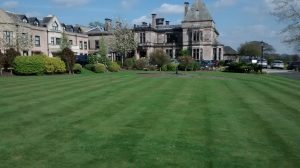 We have a contract to maintain the grounds at Rookery Hall Hotel & Spa in Nantwich. Having seen a Synergy on demonstration at our local dealer GGM Groundscare at Colne, I knew immediately it was the mower for us. It gave a lovely finish cut at pretty fast forward speeds. The mower performed brilliantly and has exceeded our expectations. It gives a cylinder mower striped finish and has transformed these grassy areas.